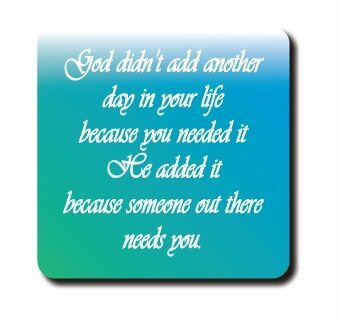 God didn’t add another day to your life because you needed it. He added it because someone out there needs you. Religious Magnetic Quote M-15-0003 are made of 100% recycled materials and made right here in the United States. Enjoy brilliant colors and designs with inspirational, comical, sports related and religious quotes to fit every life event. Perfect for gift giving, stocking stuffers, teacher gifts and even kitchen or workplace decorations. These thick strong magnets are measure 3.5″ x 3.5″ and are shipped in unique gift sleeve. Inspire every magnetic surface in your life with one or more of over 100 different quotes and designs. Have a friends that needs a little pick-me-up? Communicate the feelings stirring within all of us through Magnetic Messages magnetic quotes featuring quotations from the world’s most adept writers, poets, political minds and inspirational characters.